Perhaps the most popular comfort food in the American pantheon of comfort foods, mac and cheese is one of those dishes that stirs memories … of childhood, family, best friends, and so much more. Here are some new takes on this old standby at nine popular restaurants around the state. There’s nothing better than a straight up gourmet hot dog, unless of course it’s a gourmet hot dog smothered in homemade cheesy mac and cheese topped with bacon. Go one better by adding green chile to the whole mix and this new spin on an old favorite might just become your new favorite! Mac and cheese without the hot dog is also an option. This is a double-whammy of mac and cheese. Start with an appetizer of mac and cheese bites. The pasta is baked in a creamy four-cheese blend, lightly fried, dusted with panko and topped with a smoked gouda cheese sauce. Then have a little different twist as an entrée—same four-cheeses but with hatch green chile added. No mistaking. With a giant cow on the top of its sign, this looks like a steak house. And they do have some first-rate steaks. However, the mac and cheese with green chiles on the light bite menu is rich, creamy, cheesy and one of the classics this funky Route 66 diner serves. Have it as a stand-alone or pair it with a rib eye. Start with lunch. Stay for dinner. Come back for brunch and have mac and cheese each time. Enjoy seafood mac and cheese with mahi mahi, shrimp, lobster claw meat in a smoked gouda and cheddar cheese sauce for lunch and brunch. Dinner it’s all about lobster—big chunks are standouts in this pasta and smoky, cheesy dish. This is one of those bars where you go for a drink and stay for the food. A pub grub menu of choices includes taste sensational deep fried mac and cheese bites. 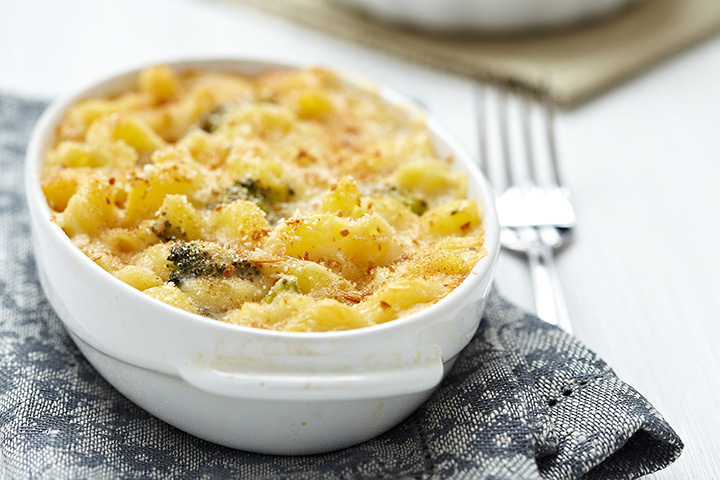 What begins with thick and velvety mac and cheese is cooled and cut into small bite-sized pieces, rolled in bread crumbs and then dropped into oil. Crispy on the outside, cheesy, warm and gooey on the inside. If you’re looking to grab a late-night snack somewhere, go here. The pub fare menu is a blend of typical British fare like fish and chips and Guinness pie and then there’s the four-cheese mac ’n cheese served on toasted bread and drizzled with that divine fungus known as truffle. Add some bacon or green chile for a little extra punch. A little R&R at a B&B in the southwest corner of the state opens the way to a meal at this delightful restaurant. The inventive lunch and dinner menu is full of dishes made with farm-fresh, seasonal, local ingredients—healthful and wholesome. And then there’s the three-cheese mac and cheese with pepper bacon and green chile and topped with butter Ritz … yes Ritz, crackers … which is a whole other story. So good, you might just have seconds. Barbecue at its best is only made better by a great selection of sides that com-plement that smoky, tart, tangy, sweet flavor. There are quite a few sides to choose from here, but the at the top of your list should be the “not your standard mac and cheese.” Tillamook, parmesan and marscapone cheeses are perfectly blended and balanced with the pasta and given a crunchy top with some toasted bread crumbs. Just right with the red chile honey glazed baby back ribs. This anytime patio restaurant is modeled after an Irish public house. Sit outside daytime, dinnertime and eventide. While you’re enjoying the outdoor ambiance try the spicy mac and cheese. It’s made with a chile con queso cream sauce with sautéed mushrooms, broccoli and tomatoes and served over penne pasta. It’s, also, a menu that will make any vegetarian smile.